In a large bowl, toss together the cabbage, cilantro, carrot and orange zest until well mixed. Set aside. In the basin of a food processor or a blender, combine the garlic, orange juice, lime juice, oregano, cumin, salt and pepper. Pulse together until the garlic is finely chopped. With the food processor or blender running on low, slowly pour in the olive oil until well combined. Pour dressing over the cabbage mixture and toss to coat. Taste and season with more salt and pepper as necessary. Refrigerate for at least 15 minutes before serving. Yields about 1 cup per serving. If you happen to have access to sour oranges, replace the orange juice and lime juice with 1 cup of sour orange juice. For a fun kick, add a finely minced jalapeño (or two!) to the cabbage mixture. Avocado oil also works in place of the olive oil, if you prefer. Some supermarkets sell pre-shredded red cabbage—it’s a great time-saving hack if you can find it. You’ll need two bags (16 oz each) to replace the cabbage in this recipe. You might not need all the dressing depending on the size of your cabbage. Use just enough to dress the slaw without it getting sloppy, and refrigerate the rest for another use. It’s a great marinade for fish or chicken! The sun is shining, the grill is fired up, and your friends and family are all laughing and having a blast in your backyard—barbecue season is upon us! Is there anything better than being outside in the fresh air with the people who make you the happiest? The only thing that might be better than the bright blue skies and great company is the awesome picnic food! Typical backyard barbecue food usually falls into one of two categories. You’ve got the meaty things that are cooked to charred, sizzling perfection on the grill—the burgers, the brats, the dogs; you know the drill. And then there’s the parade of picnic potluck side dishes—the mayo-based salads, the heavy mac and cheese, the baked beans that are more bacon the beans. All delicious, but what if you wanted to contribute something a little bit lighter, zestier and more summery? Enter this Red Cabbage Mojo Slaw. Instead of the mayo-drenched stuff you’re used to (and always afraid to eat after it’s been in the sun for more than 20 minutes), this slaw is dressed using Mojo sauce. Mojo sauce is made from lots of fresh garlic and typically sour orange juice—since most of us don’t live near sour orange groves, we hack it together with regular orange juice and lime juice. 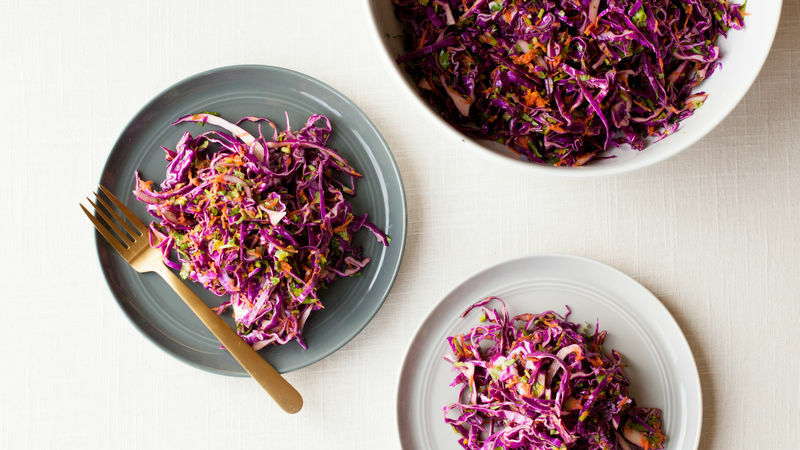 This slaw is bright (in both color and flavor), tangy and has a super-satisfying crunch. Because cabbage does a good job of holding up to dressings without getting soggy, you can make this slaw ahead—it just gets better and better as it melds in the fridge. And it comes together in all of about 15 minutes, so it’s also a great option even if you didn’t get a chance to plan ahead for that potluck that starts in an hour. The hardest part is slicing the cabbage! This slaw does double duty as both a side dish and a condiment. It is great alongside (and on top of) pulled pork sandwiches, and is off-the-charts delicious inside fish or shrimp tacos. Enjoy!